But there’s much we don’t know about our nearest space neighbor, too. We’re not sure where it came from. Some think it might be a broken-off chunk of Earth. But this is unlikely because analysis indicates that the amounts of the elements in the Moon’s and the Earth’s compositions are sufficiently different to make it unlikely that the Moon formed directly from the Earth. And there’s evidence that the Moon once had active volcanoes, but we’re not sure if it’s still geologically active. There are so many theories about the origin of our celestial satellite from the prosaic to the bizarre that I could write numerous blog posts on that subject alone. It has been posited that the Moon may be a hollow, artificial spaceship from another civilization. The Moon has other controversial mysteries, too. Some people think aliens have, or once had bases there. Some think there’s intelligently manufactured stuff on the moon – other than the Apollo debris – that the government knows about, but is not telling us. I had some unusual visions or remote viewings of the Moon. Please see this post from 2012. There are many enigmatic photos that seem to show shapes and structures on the lunar surface that don’t fit conventional explanations. Strange things have been seen on the moon for centuries — usually flashes of light or color, or lights that appear to move across the lunar surface. These are known as transient lunar phenomena (TLP), and many of the reports, dating from 1540 to 1969, have been cataloged by NASA. It is still not definitively known what causes TLPs though there are, of course, many theories. But perhaps the best source for this kind of information in the public is The Lunascan Project, an organized effort by amateur astronomers to record and document TLPs. Some such flashes of light and color might be attributed to meteor impacts or perhaps some kind of gaseous emissions, but harder to explain are the “fastwalkers” that have been videotaped by several amateur observers. At one time NORAD purportedly tracked these “fastwalkers” that also enter Earth’s atmosphere and leave again. I wonder whether they still do. The Lunascan Project is an Earth-Based Telescopic Imaging program using CCD & digital imaging technology to observe, document, and record live images of LTPs (Lunar Transient Phenomena) . The Lunascan Project is also involved in the selection and comprehensive study of archived images from NASA and other sources in the search for possible evidence of extra-terrestrial artifacts on the Moon. The Lunascan website directories house some of the best lunar images and links from around the world. A gentleman named J.P. Skipper has a website about Mars anomalies, but has dedicated a number of pages to problems with photos of the moon which he believes to have been doctored. Ken Pfeifer, the head of the New Jersey branch of the Mutual U.F.O. 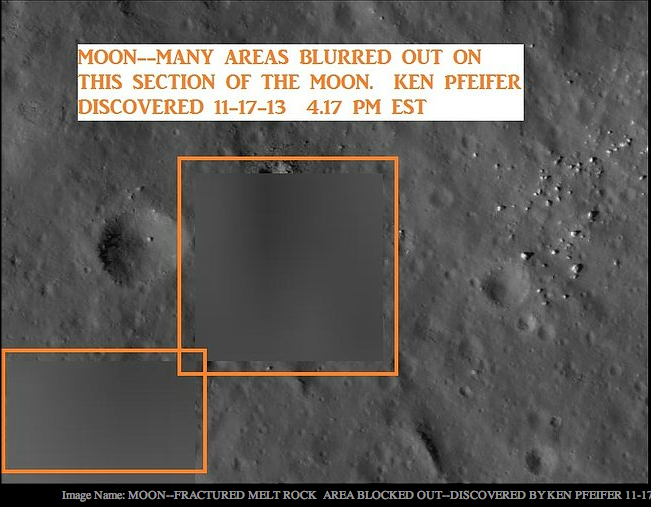 Network (MUFON) and Chief Investigator for MUFON in New Jersey, Vermont and Rhode Island, whose lunar photo finds grace this blogpost, maintains several websites with amazing photos of UFOs and other anomalies he has discovered including this gallery. Alan Caviness has catalogued a number of historical Moon anomaly sightings as well as the amazing story of Karl Wolf here. I spoke with Kate Valentine about the Moon and her mysteries on her show. Other podcasts with interesting broadcasts about lunar anomalies are the Paracast and Don Ecker’s Dark Matters. Don Ecker is a former editor (with his wife Vicki) of UFO Magazine and has a particular interest in unexplained Moon mysteries. I recommend listening to Don’s interview with Vito Saccheri which is Episode 112 of Dark Matters Radio on iTunes. A provocative book called Somebody Else Is On The Moon by George H. Leonard is prominently mentioned on this episode and I intend to read every word of it (free download). Debunkers point to pareidolia as the reason for Moon anomalies. Pareidolia is defined by Wiktionery as: The tendency to interpret a vague stimulus as something known to the observer, such as interpreting marks on Mars as canals, seeing shapes in clouds, or hearing hidden messages in music. This does not explain why NASA smudges out parts of the photographs of the far side of the lunar surface. I maintain an open mind and I am still searching for answers. A possible building on the moon. Thanks, Jackie 🙂 I think I would become an accredited cosmologist instead of an amateur one. Oh to be 20 again. Thanks, Bill! I have often thought about the claims that one of the Martian moons (Phobos?) is hollow and artificial. There is so much to be learned. HNY back at you and yours. Great food for thought Fahrusha. 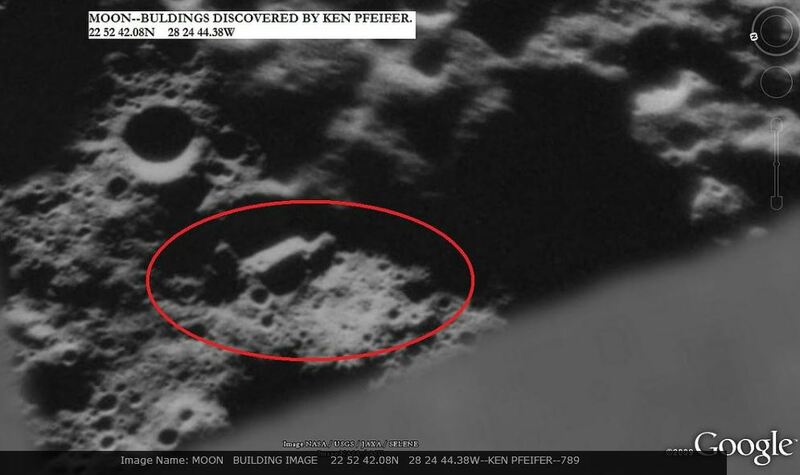 The remote viewer par excellence Ingo Swann is on the record as having remote viewed extraterrestrials on the Moon along with edifices, towers and buildings resembling those described by Karl Wolf in the photos he claims to have seen when he was employed at Nasa. It is truly amazing that so many of the photos of the Moon and Mars considering the technology available today are of such low quality with blurred or blacked out photos and or poor definition, I also have pondered why when the primary goal was to set up a manned station on the Moon all plans for that were scrapped to put a space station in orbit instead and manned forays to the Moon were all but forgotten. Hmm strange. Great stuff, thank you. Thanks Michael! One of my biggest regrets is that I never met Ingo Swann though many people I know knew him well (in NY, VA and CA). It would be nice to have the definitive answers. One thing is certainly true, there are higher resolution photos that have been taken of the far side of the moon than are in the public domain. Fascinating, excellent post Fahrusha. The blanked out areas on the photos are really suggestive. Thank you Lauren. Did you take a look at the volumes of photos on the links? Some interesting stuff out there. Yes, Jill, we all need to understand more about Space. It literally boggles our monkey brains. 🙂 So much to learn, so little time. Thanks for stopping by. it does look like buildings on Mars, especially one particular photo. I wonder why Nasa has blurred out parts of the photos? Hmmmm. Thanks Gerry! You have asked an excellent question. It is difficult enough to try to know what is true, of course the follow up question is why. I enjoy your blogs Fahrusha, I worked a MUFON case around TLPs and still have the case report that I filed available if you would like a copy: MUFON CMS #2667 Case Submitted to MUFON on 11/09/2003. Please be sure to visit NASA’s Lunar Reconnaissance Orbiter (LRO) imagery for your research as this is the direct source for moon images. When performing research & investigative analysis, one should get their data directly from the original source rather than from a third party. I dislike actual frauds and hoaxes as much as you do. Back at’cha, Ken. Happy New Year and thanks for allowing me to use the photos you unearthed. Thank you for the post, was following the links but the link for ‘Fastwalkers’ was blocked by my virus software (Bit Defender) as containing Trojan.IFrame.SX. which is apparently a known virus. Best alert the owner of that site and not go there until the problem is solved. The site may also get red flagged by google if it hasn’t already happened. Often, owners of sites do not even know their site is infected. Thanks Eva, Will do! Now I guess I’d better shut down that link. Try Ingo Swann’s Penetration, free download, if you haven’t already seen it. The most important thing to remember in research is that excellent or persuasive writing doesn’t necessarily ensure that the research presented is valid. It is also important to ask whether the author’s evidence is grounded in objective research or is it of a personal interest of the author? Does the author’s evidence support the claim and is the evidence provided by the author manipulated to serve an agenda? It would be my contention that data/evidence provided by a third party cannot be authenticated, thus is not valid. In the case of images of moon geography, I would suggest that NASA images would be the highest quality and best source of valid data. You might like to contact George Tahu, (Program Executive for Mars & Lunar Exploration) at NASA in Washington, D.C. who might be able to assist you further. Also you might note, that like Rod Serling, I have presented the information and links in my Moon Anomalies article “for your consideration” and as I said, scientific theories abound. Debunkers are a dime a dozen. Nothing they present is valid.